Prague or Praha (in Czech), Czech Republic’s capital city is on everyone’s ‘must-visit’ or ‘bucket-list’, and it’s easy to see why. With spires dotting its skyline, swan ruled Vltava river, and the 9th century Prague castle overlooking the city from a hill, Prague can be mistaken to be a kingdom right out of a fairytale. No wonder this city is nicknamed ‘City of Hundred Spires’. Being a budget-friendly city, travelers are constantly ‘ticking-off’ Prague from their bucket-list. No marks for guessing how touristy Prague can get. It is unlikely that you’ll find the Old town square or the famous Charles bridge all to yourself. So, here’s offbeat Prague for you: my top 4 suggestions. This tour might not be everybody’s cup of tea, but it sure does give you an insight into Czech Republic’s communist regime, the StB (Czech intelligence agency), and the Velvet revolution; all this while you stroll in the old city with your tour guide. The highlight of this tour is a visit to the communist museum and nuclear bunker in Žižkov district (Prague 3). Yes, a nuclear bunker from the 1950s! It can accommodate close to 5000 people, can fully function within 20 minutes in case of an emergency, has a working air-purifier, has a decontamination room—all 16 meters underground. You cannot independently visit the nuclear bunker; the only way to see it is an organized tour. The whole tour lasts for approximately three hours, and it costs 600CZK. 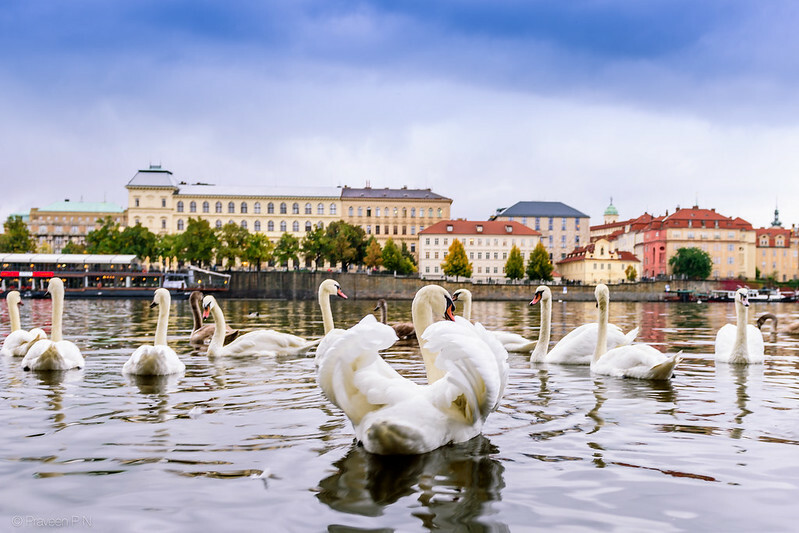 Prague’s famous river Vlatva is ruled by snow-white swans. These beauties are in hundreds, and they gather around the shores and look out for food from humans. In the Lesser town, Malá strana, close to the Franz Kafka museum, you can watch a bevy of swans chilling, flaring their wings, or even on a strife with a Nutria (water-rat) for human food. This is a great place to spend some time away from the crowds, admiring the city’s beauty. There is no dearth of statues and sculptures in Prague; Charles bridge itself has 30 statues mounted to the balustrade. Besides these, the city has a number of strange statues, many by the country’s famous sculptor David Cerny. Take a walk across the city and see how many statues you find. Few of them are listed below—some we went looking for and few we stumbled upon. Piss – Two naked mannequins that move at their hips and pee in a Czech Republic shaped pool. This is David Cerny’s masterpiece and located in Malá Straná (Lesser town) in the small plaza of the Kafka Museum. The cool thing is that visitors can send a SMS to a mobile number displayed next to the sculptures and the statue will ‘write’ the message in pee. Another of David Cerny’s statues. Located at the intersection of Husova and Skořepka street between The Old Town Square and Charles Bridge. This statue is believed to portray Sigmund Freud, the father of psychoanalysis, hanging onto a roof. A kneeling pregnant lady made of steel panels named UnUtero. What makes it interesting is you can crawl inside the woman’s stomach and get a feel of ‘being in the womb’. Located on Dlouhá street. The Metamorphosis – The head of Franz Kafka located outside the shopping mall Quadrio. This fascinating massive sculpture is made of layers of mirrored steel which rotate in different combinations and takes the shape of Kafka’s face. At the entrance of Kampa museum, these 8 foot tall babies are creepy, but worth a dekko. like they are ready to board the next ferry. Find your way through the cobbled alleys of Malá Straná to this wall dedicated to John Lennon. The broken men, a memorial to the victims of communism is located on Újezd street at the foot of Petřín Hill. Beer being the most popular drink in Prague, Prague has a number of beer gardens. Letná beer garden in Letenské Sady or Letná park in Prague 7 is the only one we visited. This beer garden is built on Letná hill and has stellar views of the city and Vltava river. There are bike paths, a skatepark, many playgrounds, the Metronome (in place of the Stalin monument), a restaurant, and panoramic views of the city. The only let-down being beer (and wine) is served in plastic glasses, and food is limited to sausages and grilled cheese. Letna park is famous among locals as well as tourists alike and gets crowded in summer. In October, however, it was different; fewer people in the park and many empty picnic tables. I would suggest to pack some food and head out here in the evening to watch the the sun go down. The other famous beer garden (we haven’t been here) is Riegrovy Sady beer garden located in Riegrovy park in Prague 2. Prague food tour – EatingPraguetours. We did a food tour with these guys in Rome, and we were highly satisfied. I’m guessing they have a great tour in Prague too. In collaboration with GPSmyCity I’m hosting a giveaway of a FREE city guide for Prague (Czech Republic). What is GPSmyCity? GPSmyCity provides walking guides (for both iOS and Android) for over 470+ cities worldwide along with city maps and articles. To know more about them click here. Comment on this post and tell me your favorite place in Prague. If you haven’t been to Prague, tell me which European cities you are planning to visit in the near future. Also, mention if you require the promo code for iOS or Android. Contest is open until 20th June 2016 midnight PDT. Comments/entries after this date will not be accepted. Free promo code to download GPSmyCity Prague will be sent to you by email by 25th June 2016. Once the promo code is issued it expires in 28 days, if not used by then. Once downloaded, the city walks app does not expire. Promo codes can be used on both iOS (iPhone and iPad) and Android devices. Promo codes will be awarded on a first come first served basis, so comment below now! Use a valid email address to comment as you will receive your promo code in that email id. Wow…nice! I would love to visit Slovenia someday. I’ll mail you the App promo code between 20th and 25th June. Hi, I have mailed you the promo code. Please check your spam folder as well.